This exchange illustrates one of the most pressing challenges of the Anthropocene: who will govern the complex global forces unleashed by the interactions between humans and the environment. Mayor Peduto’s tweet points to a key question: can cities (and mayors) in fact provide the leadership required in this new era? For the Anthropocene—defined as our current geologic epoch in which humankiund has emerged as a significant force shaping the future of the planet – raises fundamental questions about environmental governance. The political incentives for local government leaders are on one level fairly straight-forward, yet on another level extremely complicated. City leaders can make environmental progress while saving money through energy efficient practices, delivering day-to-day fundamental services such as safe drinking water and reliable wastewater reclamation, or satisfying citizen demands for recycling and bike paths. Constituents hold city officials directly accountable for these municipal service expectations and will reward elected officials who deliver the goods. The politics are consensual, of limited controversy, and favored by the large majority. But there are more complex public policy challenges without easy answers. City officials cannot duck the confluence of urban growth, inadequate infrastructure investment, and the impact of severe weather events resulting from increased climate variability. City mayors must confront costly economic and infrastructural challenges in their communities. Municipal first-responders must be prepared in the event of extreme weather events. Solutions to these challenges are not easy. Take for example the cycles of severe drought and extreme heat which are magnified in urban areas and fall unevenly on those who live in poverty. The Centers for Disease Control report extreme heat exposure caused more than 7,800 deaths in the U.S. from 1999 through 2009. One in four deaths from weather-related events is caused by extreme heat. 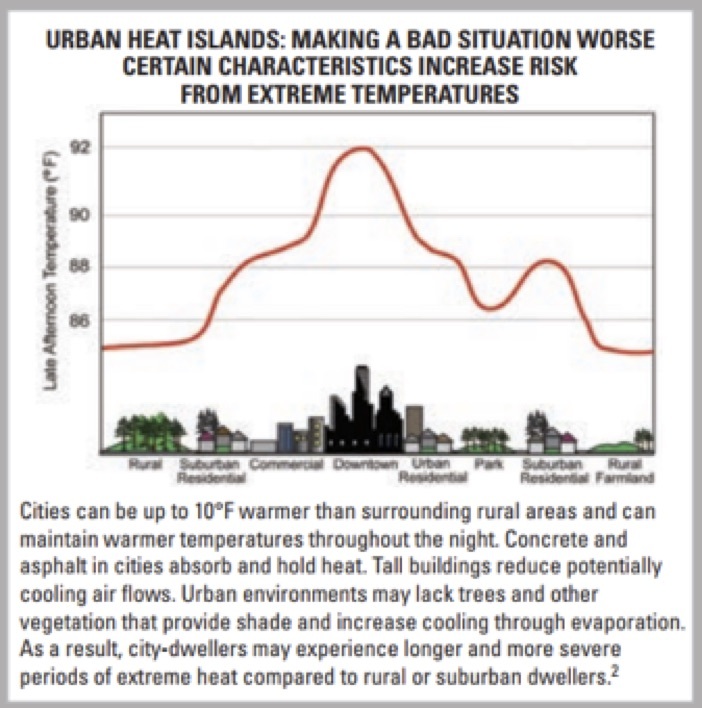 “Urban heat islands” of concrete and asphalt increase temperatures by 10°F or more than surrounding rural areas and hold that heat longer. Tall buildings reduce potentially cooling air flows, and most urban environments may lack trees and other vegetation to shade and cool the area. The 1995 heat wave, which struck Chicago, Illinois, resulted in more than 500 deaths in a four-day period, with the victims being disproportionately elderly, black, and poor (Klinenberg 2002). 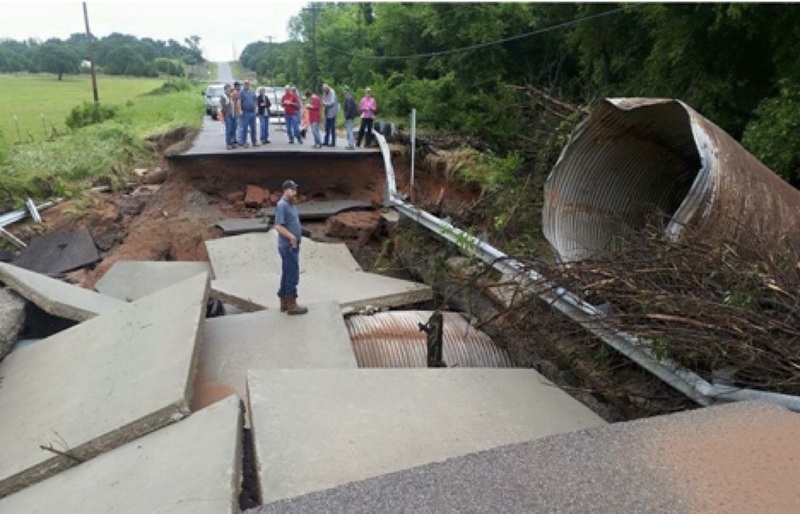 Another infrastructure challenge affecting many communities is the management of stormwater. Urban development increases runoff from rainfall and snowmelt by removing vegetation, compacting soils, grading the land surface, disrupting natural drainage basins, and increasing impervious surface. The volume and frequency of floods increase, and buildings constructed in flood-prone areas are exposed to greater flood hazards as a result of new development. Author and other city officials confronted significant infrastructure damage in Norman after May 2015 flooding. Photo: City of Norman. The Union of Concerned Scientists notes that as average temperatures have risen, more rain has fallen during the heaviest downpours. Very heavy precipitation events — defined as the heaviest one percent– now drop 67 percent more precipitation in the Northeast, 31 percent more in the Midwest, and 15 percent more in the Great Plains, compared to 50 years ago. Stormwater run-off can quickly overwhelm other municipal infrastructure including sewer pipes, roads, and bridges. Like the impacts of extreme heat and drought, flooding has a disparate impact on persons living in poverty as was demonstrated so dramatically with Hurricane Katrina. As these examples suggest, the problems of the urban environment are not simply about delivering services efficiently and effectively, but often take on redistributive elements, regulatory challenges with important equity dimensions, and big ticket investment choices which are often highly politically contested. While some policies involved with climate protection represent day-to-day city programs such as sanitation, transportation and land use, and building codes, increasingly the issues associated with climate variability and sustainability tackle problems that do not recognize jurisdictional boundaries and bring into conflict competing goals of economic growth, environmental protection, and social equity. Ironically, the very things that cities celebrate as successes – new development, more people, new business investment, bigger budgets – are inextricably entwined with the consumption of more fossil fuels and are the source of increased environmental impacts that must be managed and mitigated. Cities matter to defining our future, simply because that is where more and more of us live. In the U.S., the 2010 Census reported almost 81 percent of the U.S. population lived in urban areas, up from 79 percent in 2000. The Census Bureau includes towns with as few as 2500 people in its definition of “urban”, so not all areas live up to our stereotypic image of a city. Perhaps a more accurate conception of growing urbanization is captured in the metropolitan statistical areas and the Census Bureau’s identification of 486 “urbanized areas” of 50,000 or more people, accounting for 71 percent of the U.S. population. Thirty individual cities across the U.S. are home to more citizens than the least populated states (Wyoming and Vermont), and the eight largest metropolitan areas have populations larger than 30 of the states. Increasing urbanization within multi-jurisdictional metropolitan areas presents new challenges for governance. For example, as Sunbelt cities like Oklahoma City attempt to wean themselves from car-centric transportation modes and create solutions to regional traffic congestion, whole new governing structures and interlocal relationships must emerge to facilitate cooperation and build regional transit capacity. Political scientists Bruce Katz and Jennifer Bradley (2013) argue that these urban conglomerations are successfully asserting leadership and using collaboration to overcome competitive zero-sum politics to create new economic policies. But can cities find common ground to do the same on environmental issues? The conglomeration of formally independent jurisdictions in our largest metropolitan areas paradoxically means both that those individual cities cannot successfully act on their own, and that opportunities for them to avoid action abound. This complexity in intergovernmental relations mirrors the complexity of the environmental challenge. Global forces do not follow national borders let alone city boundaries. While each metro area has a unique makeup, an example illustrates the complexity of the challenge. The Greater St. Louis metropolitan area, 20th largest in terms of population at 2.9 million, encompasses not only the original City of St. Louis but all or parts of eight Illinois counties, ten Missouri counties, and upwards of 100 municipalities in St. Louis County, itself a separate governing structure over the area immediately west of St. Louis City. Today the City of St. Louis includes an estimated population of 311,404, compared with more than a million residents in St. Louis County. Many of the suburbs grew in population as highly segregated communities resulting from a history of school segregation, housing discrimination, and racially-driven policies governing interstate highways and infrastructure development. The Mississippi River, once the natural boundary between Missouri and Illinois, is crisscrossed in a variety of ways and represents a shared resource. Individual jurisdictions have multiple opportunities to shirk responsibility for environmental management, and promoting regional collaboration is exceedingly difficult given the history of the region. Some analysts see the divide between the President and mayors solely in partisan political terms. Most academic studies of which cities have been on the forefront of urban environmental management identify partisan affiliation as a significant variable. Cities with more Democratic voters are more likely to publicly commit to climate protection initiatives. But partisanship is not the sole determinant or the most impactful. Other factors include education levels in a community, form of local government, bureaucratic capacity, and mayoral leadership. In addition, I argue in research on this topic that local officials may face more homogeneous constituencies than elected officials at the state and national level (Rosenthal et al 2015). The like-mindedness of their citizens means local elected officials may see their incentives for action outweigh the challenges of intergovernmental cooperation and the pressures to follow partisan talking points. Katz, Bruce and Jennifer Bradley. 2013. The Metropolitan Revolution: How Cities and Metros are Fixing our Broken Politics and Fragile Economy. Washington D.C.: Brookings Institution. Klinenberg, Eric. 2002. Heat Wave: A Social Autopsy of Disaster in Chicago, Chicago, IL: University of Chicago Press. Rosenthal, Cindy Simon, James A. Rosenthal, Jonathan D. Moore, and Jamie Smith. 2015. “Beyond (and Within) City Limits: Climate Policy in an Intergovernmental System.” Review of Policy Research, 32(5). This entry was posted in Cities and Our Future, Reflections, Urban Anthropocene and tagged Anthropocene, cities, climate change, environmental governance, Urbanization. Bookmark the permalink. As we are discussing urbanization, I was wondering about the flipside: what happens to rural areas that are vacated by urbanization? I can see a lot of negative consequences for the the people left behind, but also opportunities for reclaiming the land for various purposes. Thanks for the fascinating post, Cindy! Your discussion of cities in their metropolitan context reminded me of a problem that typically pops up with respect to environmental governance–namely that the borders of political jurisdictions seldom line up with environmentally relevant geographical divisions. The clearest example is probably with watersheds: though it makes sense to manage a watershed as a whole, political units usually don’t line up with watershed boundaries, leading to fragmented management and the kind of temptations to avoid action, or to act in ways that damage other stakeholders, that you mention. So my question is: has the effort to get cities in a region to find common ground on environmental issues included the discussion of ways they might be connected at the ecosystem level? Is there work that you know of that brings together the ideas of “metropolitan region” and “eco-region”–either in theory, or in actual policy-making? I look forward to your next two posts! Great question and finding common ground is a central challenge! The history of watershed protection probably best illustrates how difficult top-down approaches have been to align natural environmental boundaries with political responsibilities. For a detailed review of this history, I recommend a 2006 article by Andrea Gerlak in Publius (https://academic.oup.com/publius/article/36/2/231/1934517). During the New Deal, the intersection of the Great Depression and epic climatic events (drought and flooding) launched an era of federally-centralized water resource development projects imposed upon a natural geographic area rather than along political boundaries (e.g. the Tennessee Valley Authority). Economic recovery motivated Congress to act, but federal agencies vied for bureaucratic dominance leading to intense conflict over competing uses and control. In the 1950s, federal policy favored creation of river basin commissions but these too confronted agency competition and political disagreements between levels of government. During the 1980s with President Reagan’s push toward devolution of authority to the states, federal policy encouraged more collaboration than regulation, for example, the National Estuary Program, a watershed approach to protecting coastal water quality. The 1990s saw a continuation of watershed approaches with states often taking the lead in planning and management of watersheds within their boundaries or groups of states through interstate compacts. Some of the best examples of collaborative approaches can be seen in the Sacramento-San Joaquin River, the Florida Everglades, Chesapeake Bay, and the Great Lakes Water Quality Initiative. Thanks for your post Cindy, very thorough. Two years ago, TNC hosted a forum to begin considering the challenges of Urban Heat Island effect in Oklahoma City. Everyone we came across agreed (similarly to the sentiment mentioned in your post by Mayor Brainard) that keeping ambient temperatures down, reducing fine particulate matter, and increasing natural storm water filtration was a good thing. We had Senator David Holt open the presentation stating that he would be in favor of funding nature-based infrastructure in future MAPS proposals. The science is clear, urban nature significantly impacts air quality, water quality, temperatures, and biodiversity but we also know it does so much more. Having local greenspaces for people to enjoy can drastically impact stakeholders physical and mental health. It has been suggested that adults benefit but a recent study shows mental health benefits for middle schoolers as well. To follow on to Zev’s question a bit and based on your experience in government and as a researcher, what will it take to get serious public funding in place to develop and sustain both innovative and widespread nature-based solutions for OKC? Your question about funding is obviously central, Cody Pepper. 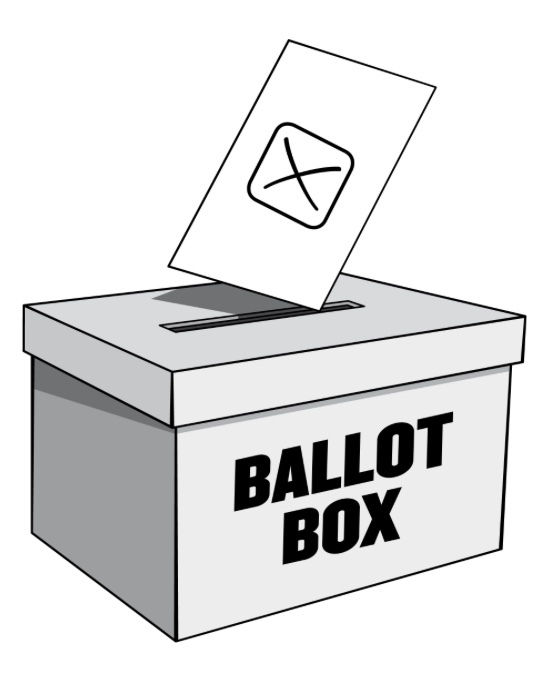 There are a mix of options available — special capital referenda like MAPS or Norman Forward, stormwater utilities, impact and other development fees, state and federal grants, and private initiatives. Probably all of these strategies will be necessary to create the kind of coordinated and comprehensive plan which is needed. Before launching a fund plan, city leaders must take two critical first steps. First is the need for comprehensive planning on the metropolitan level. Second local leaders need to educate local citizens and developers about the economic advantages of green infrastructure as well as the environmental imperative. Kansas City seems to be trying to tackle both of these tasks with a seven county green infrastructure plan, see http://www.marc.org/Environment/MetroGreen-Parks/Current-Projects/Green-Infrastructure-Framework . Norman’s City Council is looking at ways to incentivize green building practices, and in the past the Council has approved a couple of innovative, inter-connected green stormwater developments which manage run-off and also provide residents with recreational opportunities. Incentives alone will not achieve the goals, but they are another piece of the puzzle.